Six years ago on September 24th 2012, the Irish Aesthete made its debut. What was the intent behind this initiative? Impossible to recall, although then as now a primary motivation was encouraging greater and more widespread engagement with Ireland’s architectural heritage, much of which remains at risk from either neglect or misuse. Over the past six years, some aspects of the site have changed, others remained the same. Very soon, the format of a thrice-weekly posting was established, with longer features each Monday and shorter ones every Wednesday and Saturday. The quality of photographs has certainly improved and, one hopes, will continue to do so (not least thanks to improvements in the calibre of mobile phone cameras). There has been a consistent effort to represent the entire island of Ireland, and to show the good, the bad and – with regrettable frequency – the ugly. What hasn’t altered throughout this period has been the attention of friends and followers, which is enormously appreciated: without regular support and feedback, it is unlikely the Irish Aesthete would have continued for so long. Therefore thank you to everyone who has shown interest in this site: you make it worthwhile. Happily today the Irish Aesthete is read across the world and has led to other opportunities for writing and speaking engagements, thereby helping to spread the gospel of our architectural history. A further outcome is that early next year the first book of Irish Aesthete photographs will be published, about which more in due course. Meanwhile, to mark today’s anniversary, here are six personal favourites taken over the years. You may have made other choices from the site: please feel free to share your own suggestions. Of the six shown above, two are properties in private hands, two are in public ownership, and two are ruins. All however are important elements in our common cultural heritage. A few miles off the coast of north Dublin lies Lambay Island, extending to almost 600 acres and at its highest point rising some 416 feet. In 1904 the island was bought for £5,250 by Cecil Baring, later third Lord Revelstoke, a scion of the English banking family. As is well known, some years earlier Baring had created a stir in Anglo-American society by eloping with Maude Lorillard (whose father created Tuxedo Park in upstate New York) then wife of a business partner. Under these circumstances, it is understandable the couple welcomed a retreat on Lambay, although conditions when they first arrived there were primitive. The main accommodation consisted of a small stone blockhouse likely built in the fifteenth century to deter pirates but by the early 1900s occupied by lifestock. Bad storms in the year immediately previous had devastated the surrounding woodland, making the building even more inhospitable. Accordingly in 1905 the Barings commissioned the architect Edwin Lutyens to overhaul and extend the entire site. The original block is constructed from an indigenous blue-green porphyry flecked with feldspar crystals: this was retained for the newer sections but cut limestone used for window and door cases. Lutyens’ additions are wonderfully sensitive, respectful of what was already there, gracefully understated yet still able to make a powerful impression. The old building was extended and a new, larger wing added but set into rising ground so that it does not overwhelm: as though to maintain their separate origins, the two sections are linked internally only by a ground-level passage. Lambay’s quay lies on the western side of the island, close to which are a line of cottages and another, larger residence known as the White House, as well as an open air tennis court and, further away, a small chapel. 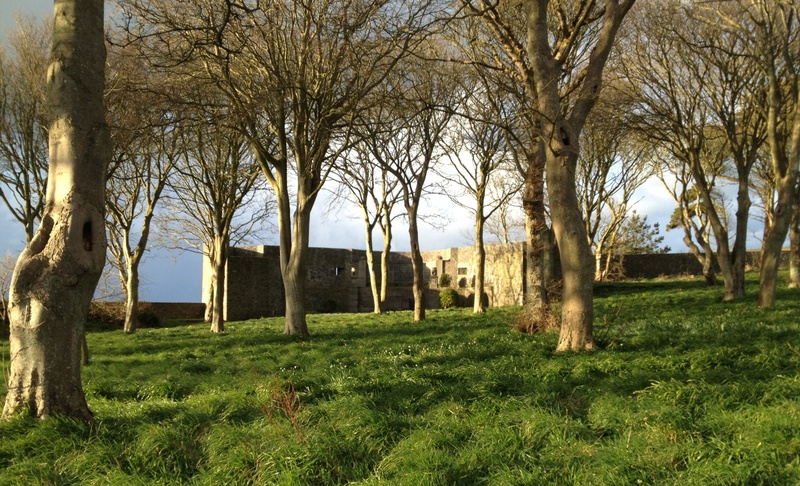 Access to the main house, Lambay Castle is reached after a short walk across a meadow. One then reaches a pair of oak gates set into a stone encircling rampart. There was always some kind of defensive wall here, but Lutyens raised its height to create a battlemented walkway around which one can perambulate. The ramparts also provide shelter against the elements, necessary in such an exposed site, and they have allowed trees and vegetation to flourish within the enclosure more successfully than would probably otherwise have been the case. Within the walls and to the left is a large altar-tomb, again designed by Lutyens and erected by Cecil Baring to the memory of his wife following her early death in 1922. The other side of this section of the enclosed garden is mostly a plantation of trees serving as a further protective belt against high winds. This means that behind the main house there can be spacious lawns and, to the south, a walled kitchen garden. East of the old house Lutyens not only added additional accommodation but also a series of service and farm buildings. Lying immediately adjacent to the property, these might be intrusive but their impact has, once more, been softened by clever landscaping. Here the architect worked with his frequent collaborator, garden designer Gertrude Jekyll. Together they devised a series of compartmentalised spaces beginning with a courtyard, once more accessed via a pair of oak gates, that leads up to the front of the old building. A stone path runs through the lawn and is in turn bisected by a narrow water course with small pools at either end. To one side another gateway opens into a further courtyard with views of the extension unobtrusively tucked behind terraced beds and flights of stone steps. So it goes on, with one space gracefully giving way to the next, none especially large, all complementing what has gone before, and what will come after. The planting in each case is slightly different but the entirety conforms to an observation made by Lutyens at the time that, ‘a garden scheme should have a backbone, a central idea beautifully phrased. Every wall, path, stone and flower should have its relationship to the central idea.’ More than a century after its creation, Lambay Island retains the same beautiful phrase, as clear and as welcome as when first uttered. There are advantages to seeing a house like Lambay Castle, County Dublin in the depths of winter. During the rest of the year, the handsome layout of the surrounding gardens is inclined to distract attention from the ingenuity of Edwin Lutyens’ early 20th century design, the manner in which he enfolded an older building into the larger property, melding the two so thoroughly that without awareness of his plans it is difficult to recognise where one ends and the other begins. Likewise, his clever integration of different floor levels on this site becomes clearer during the present period when plants are cut back and the eye can focus more clearly on the house’s structural rhythm. In April 1904 Cecil and Maude Baring bought Lambay Island, off the coast of north Dublin, for £5,250. The couple had met a few years earlier in New York where he had gone to work for the family bank and she was married to one of his partners: having eloped together and following her divorce, they married. But given public attitudes at the time, it is understandable the Barings should have remained somewhat aloof from society and relished their life on Lambay where they commissioned Edwin Lutyens to restore and extend an old castle. Together with their three children, they lived a paradisal existence until almost exactly 18 years after buying the island, Maude died of cancer in April 1922. She was buried on Lambay, Lutyens designing a large curved mausoleum inside the rampart walls. 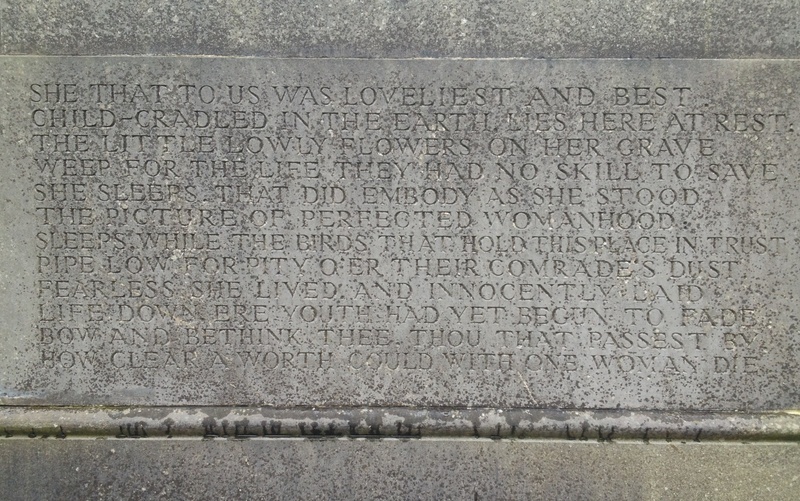 The memorial is both austere and yet highly personal, and at the centre of its front her grieving husband placed the plaque shown below. I shall be writing more about Lambay Island in a few weeks’ time.